Go Nuts!™: Your barkin’ doggie will go nutso over these extra crunchy peanut butter, molasses, and protein packed wonder biscuits that keep dogs strong and their joints in tip-top shape. Pucker Up!™: Get up close and personal with your barkin’ doggie after these mint leaf, honey, and flaxseed biscuits help give it minty fresh breath and a shiny coat. Get Pumped!™: Loaded with pumpkin, oatmeal, and cinnamon, this savory biscuit is sure to keep your barkin’ doggie pumped up with a regular digestive tract and strong immune system. 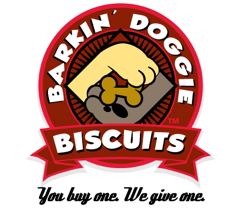 Every Biscuit You Buy for Your Barkin’ Doggie, We Give One to A Barkin’ Doggie in Need! Barkin Doggie Biscuits™ has also joining forces with no-kill shelters, rescue groups, and foster networks across the country to provide their doggies with tasty dog biscuits as well. For more information, visit BarkinDoggieBiscuits.com or email info@barkindoggiebiscuits.com.